Our monthly cinema afternoons are done with Friends of the Broadway Prestwick. The fabulous pop up cinema equipment is theirs, and together we put on wonderful afternoons. 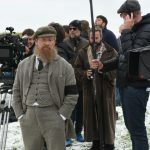 The next event is a bit different….we’re thrilled to announce a special screening of the BAFTA Scotland award-winning film Tommy’s Honour, complete with an introduction and Q&A session with the director, Jason Connery. This 2016 film is the story of Old and Young Tom Morris: an intimate, moving tale of the real-life founders of the modern game of golf. If you’ve ever asked why Prestwick is called the Birthplace of Open Golf, it’s because of these men. I am very deeply moved that Tommy’s Honour will be shown in Prestwick and in some way helping to not only raise awareness but also raise money to fight this pernicious disease. Since its premiere at the Edinburgh International Film Festival in June 2016, the film has ‘scored a hole in one’ with critics, with the Daily Express noting that ‘Connery delivers a touching father/son relationship and an interesting look at the moral certainties of Victorian Britain’. The film’s cast includes Sam Neill, Peter Mullan, Jack Lowdon and Ophelia Lovibond. With the generous cooperation of Prestwick Golf Club, we’ll be showing Tommy’s Honour where it all began – the location of the first Open championship and the first course designed by Old Tom Morris, Prestwick’s first Keeper of the Green. For this unique event, Prestwick Golf Club will be welcoming the public to the grand “Smoke Room”, overlooking the course, to watch the film in comfort. Date/Time: Thursday 25th April. Doors open at 6:30pm, film introduction at 7pm, film starts 7:15pm. Q&A session after the film ends. Tickets are free, but will be limited due to the size of the venue (and for people aged 14 years and over). From 10am Saturday 06/04/2019, email hello@broadwayprestwick.org.uk to request tickets, or go into Prestwick Library while tickets are available. A maximum of two tickets per order, please. We’ve wanted to show Tommy’s Honour in Prestwick since the film opened the Edinburgh International Film Festival in 2016. Prestwick is proud of its heritage as the Birthplace of the Open, and we’re delighted to make this event happen now. Together with Dementia Friendly Prestwick, we’re creating inclusive, welcoming and relaxed cinema experiences in Prestwick. Jason Connery supporting us with this event is a huge honour, and we have no doubt about the very warm welcome he’ll get here. We are grateful to Ken Goodwin, Secretary of Prestwick Golf Club, who has worked with us to create a one-off “boutique cinema” experience in the middle of the prestigious Clubhouse. The Tom Morrises were an integral part of the development of golf in Prestwick and of the early Open Championships. Prestwick Golf Club is delighted to welcome the Friends of the Broadway Prestwick and Dementia Friendly Prestwick to the Club for the screening of Tommy’s Honour. The community-led activity of Dementia Friendly Prestwick aims to strengthen social support and our cinema work is part of a platform of locally-directed work to support people living with dementia and their carers. South Ayrshire is proud to be the birthplace of The Open and with so much to offer visitors, it’s no surprise that when the competition came here in 2016 it attracted 173,000 spectators to Royal Troon. I’m delighted Jason Connery will be in Prestwick to highlight Dementia and help raise some funds, I hope he also finds time to explore and uncover even more of our history. We look forward to welcoming you. Tickets available from Saturday.